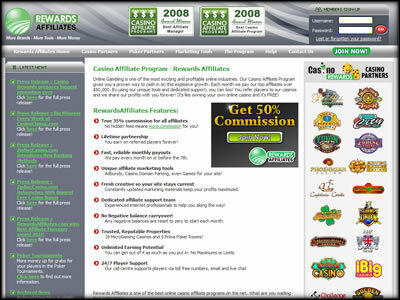 When it comes to the amount of Brands to promote, Rewards Affiliates Program is second to none. They have 24 quality Brands to promote, which include 19 Online Casinos and 5 Online Poker Rooms. Some of the most popular Brands are, Golden Tiger Casino, Casino Classic and Blackjack Ballroom. All of Rewards Affiliates Program's Brands are powered by Microgaming, the Best Online Gaming Software provider in the industry, it also allows them the ability to accept some US players.